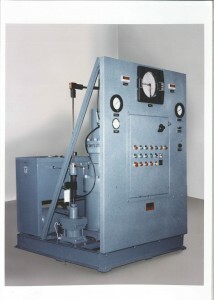 The system, as far as the pressure generation is concerned, is quite automated – once the pieces to be autofrettaged are connected to the output of the system, the operator presses “start” and the system will generate the necessary high pressure, hold it for a predetermined time, and release the pressure. The unit shown in the photograph has a 5 horsepower hydraulic drive, and requires 3 phase power, “shop” air, and cooling water for its operation. The unit requires a floor space of 50” x 58” and stands 76” tall. If desired, it can be supplied with casters with brakes (this adds about 6” to the height) for improved mobility in the plant. This particular unit (pictured here) uses a Harwood SA6 type intensifier to deliver 3.6 in3 per stroke at 150,000 psi. Other sizes are available. For more information or for any questions, please contact us via the website contact form or call us.